Implementation has stuck, and it’s now bound as a book. It’s a beautifully designed full-color hardback that documents this project about the war on terror, allowing the reader to view photographs showing where the novel manifested itself while also reading the entire text of the novel. In 2003, when Scott Rettberg and I were fairly close by (he was near Atlantic City, I lived in Philadelphia), we decided to write a rather atypical novel together. We collaborated from concept through proofreading, and beyond that stage, to write eight installments of three sheets each, with ten shorts texts on each sheet. The texts we wrote were, in 2004, printed on stickers – shipping labels – and adhered to public surfaces around the world by the two of us and by other participants in the project. Initially, we mailed each installment to a group of people without consulting them beforehand. Then, we made the sheets available as PDFs on the Web so that anyone could download them and print them out on label paper. Some of the placements of Implementation stickers were documented in photographs, and eventually more than 1600 of these wound up on our Implementation site. > _Implementation_ is about four main characters: Frank, Samantha, Kilroy, and Roxanne, who live in a Midwestern town. The action of the novel begins in September 2001 and runs through the beginning of Operation Iraqi Freedom in 2003. One of the characters, Kilroy, is a reservist who is called up and then sent to Iraq, but the other characters are affected in much more oblique ways by the attack on the World Trade Center and the changes that follow. They continue to dine at restaurants, drink at bars, work, worry about their jobs and careers, have flings and relationships, and go to celebrations and funerals. While even a bombing in town changes little on the surface of these lives, the effects of the war can be read in shifts in their gestures, longings, and language. 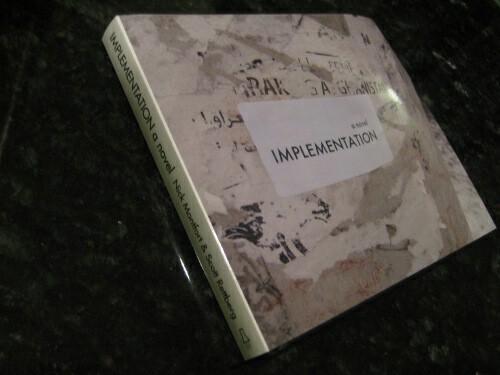 Implementation is a novel about the peripheral, everyday, psychological toll of the war on terror. The writing of _Implementation_ was done coequally. We thought up the idea together and drafted many of the texts on index cards in bars, revised some of them the same way and some by email, and worked through the emplotment, the characters, the dialogues, and essentially all aspects of the novel together. Some of the other aspects of the project were divided up. I wrote and ran scripts to assemble new Web pages and maintained the site; Scott did the photo processing and was certainly the more avid photographer. (I didn’t even have a digital camera in 2004.) I contributed to the making of the book on a few occasions, but this latest _Implementation_ manifestation is thanks to Scott’s work. He secured funding from Arts Council Norway (the arts organization of his new home) and enlisted the designer Adam Richer. He also organized a new deployment and documentation of the novel in 2009-2010. If we had only the photos from 2004, a book like this wouldn’t have been possible. We encouraged people to send us pre-processed, low-resolution photos that were ready for the Web. The photos in the book are quite different. They are very suitable for print and for both reading and viewing. _Implementation_ is really quite highly slick and quite highly punk. On the slick side, in one photo included in the book, Harry Mathews (who placed some _Implementation_ stickers) stares at an _Implementation_ sticker we have placed on a wine bottle. Not represented in the book is that on July 18, 2004, Scott and I were stopped by three police officers outside Penn Station for photographing an _Implementation_ sticker which was, as we learned, on a bomb-proof trash can. One of the offers ran a warrant check on Scott as we waited. I’m pleased with the project in terms of the novel’s text, which juxtaposes the everyday experience of Middle America with that of African-American soldiers deployed in Iraq. The novel moves from the absurd (Scott’s never going to forgive me for the pirates) to the ordinary, intersecting both rather often in a way that still seems authentic and effective. _Implementation_ is also very pleasing to me because of how that text was created – collaboratively – and how it was originally shared – by mail, by PDF download, through photos on a Web site, in public spaces. Now, I’m delighted at how the book turned out, thanks to Scott’s work, and how it represents the particapatory sharing of the novel. The book is not cheap, but it’s an high-quality photography book and a novel packed into one. (It’s also being offered at cost, so only the publisher is making anything off of it.) For the street, and for the screen, you can still visit the Implementation site to view photos and download PDFs. For browsing on the coffee table, and for reading _Implementation_ like the novel it is, I do suggest the book. Only two minor crediting errors, but the book looks gorgeous! Thanks again for letting me participate! Whoops… Please let us know about them – it would be fine to do so in a comment here. It may be possible to correct the text in a future printing, and in any case, we can keep a record of the mistakes here. Well, one is just a typo. The credit for 49 says 46 (at least from what I can tell in the preview). The other is for 54, which appears to be a cropped version of my photo? I’d really love to see the book in person. Maybe I can sucker some family and friends to get me a copy. when Adam asked me where the photo was taken. Anyway, I’ll fix that — there are going to be a couple of other minor formatting fixes as well. If you, or anybody else spots any other errors, please do comment here.